This issue was co-produced with the team at the Solidarity Economic Association. "Switched On London—a coalition of environmentalists, trade unions and community organisations—campaigns on municipal energy in London, advancing a vision premised upon clean energy, social justice and democracy." "BroodFonds is an insurance-like facility for self-employed individuals. The idea is simple: freelancers get together in small groups and put aside money each month. If any of the members are unable to work for an extended period—usually more than 30 days—they are supported financially by the rest of the group." "Co-operatives, credit unions, some forms of community economic development, community land trusts, trade unions, fairtrade, non-profit associations, and charities—all are intended, to an extent, to defend people, communities, and regions that have been marginalised by ideology, market failure, and inadequate public policy." "Co-operatively owned platforms emerged before the movement was named and is seen by some as a positive legacy of the Occupy Movement. Founding applications can be traced to Fairmondo 2012, a German co-operatively owned online marketplace supporting “responsible consumption” and kicking back against corrupt and extractive platforms." "The other thing about the relationship between co-ops and civil rights groups was that some Black liberation organisations kept their members fed and earned money to continue their political work by engaging in co-operative work and collective ownership. The Black Panther Party, which maybe some don't think of as a civil rights group but it was, used co-operative economic activity so their members can actually volunteer in the Party." "Working together as a team from different backgrounds—policy, the creative sector, product and service design, respectively—we have designed a prototype operating model and digital service called Kidoop. The service, envisioned as a web app, would allow parents to group together to form a childcare co-operative." "The Catalan Solidarity Economy is booming. The 190 member organisations of the Catalan Solidarity Economy Network have a combined turnover of 165m euros and employ 4,000 people across a range of sectors. Over 21,000 people attended the Network’s fifth annual fair in Barcelona in October 2016." 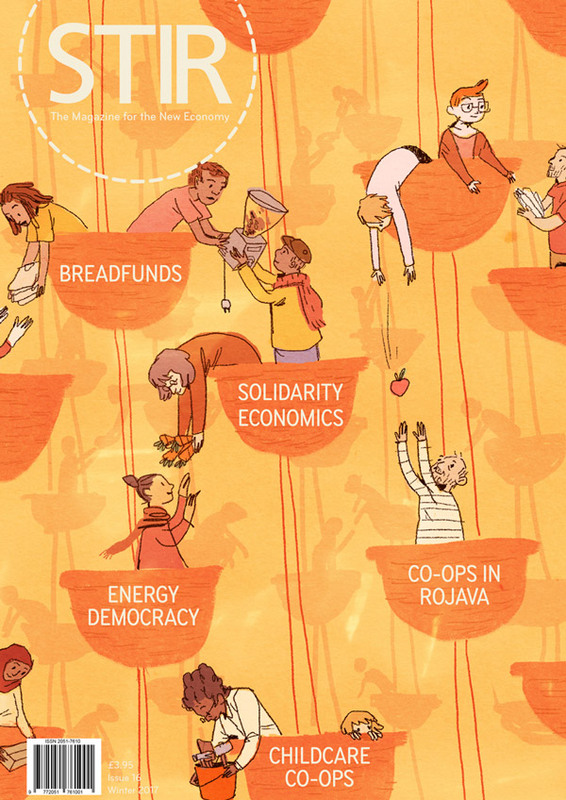 "Radical Routes’ new model facilitates existing co-ops to work together in terms of sharing finances, human resources and expertise through creating small-scale secondary co-operatives, or “Co-op Clusters”. Each cluster would operate as a confederated mutual-aid network to manage the provision of housing to its members and to support the creation of new housing co-ops." "The simple claim of platform co-ops is that if ‘we the people’ own and democratically control the platforms we use we all get a better deal; without external investors extracting value every quarter, it can be recycled within the platform so that workers get paid more (and, most importantly, a real living wage), users get better value, and together we set the rules." "Data can be used for good, ill, and is usually used for both. But to organise people, or for people to organise themselves, information needs to be accessible. The way in which the data is collected and made available, and which data is considered important has a strong influence over whether it benefits people, or exploits them." "The American Libertarian Socialist and Ecologist, Murray Bookchin, defined the ideal economy as a municipally led, moral economy that is under democratic control. He argued that the Communes’ control over the economy represents the highest developed form of Confederalism. These same principles are being applied in the economy in Rojava, the mainly Kurdish, autonomous regions of Northern Syria." "In September 2016 they started looking for someone to buy the whole company. A few weeks later, The Guardian ran an article by co-op scholar Nathan Schneider proposing to save Twitter from Wall Street through shared ownership. Readers with wickedly different politics rallied together, and #BuyTwitter came to life." Bethan Mure is is an illustrator/designer/all round creative human based in Bristol in the UK. B. also works for Scriberia as a freelance graphic facilitator. Tabitha Panter is I freelance illustrator currently living and working in Bristol, UK. She recently graduated from UWE with a first class degree. Emma Charleston is a freelance graphic designer and illustrator based in Hebden Bridge. Nick Taylor is an illustrator and graphic artist based in Nottinghamshire. He combines his love of drawing, collage, mark-making and printing with digital techniques. Daksheeta Pattni is a London-based illustrator with a sharp eye for accuracy and detail, working with the mediums of pen and ink. Her work involves detailed and intricate line and dot work. Luke Carter is an illustrator and print maker working primarily in linocut and other relief mediums. He enjoys working with political, social and historical subject matter. Pere Nadal is a filmaker & cooperative partner in Bruna. Militant in XES (Network of Social and Solidarity Economy of Catalonia). Susie Cagle is an independent journalist and illustrator, and a frequent contributor to ProPublica, the New York Times, the Guardian, and many others.